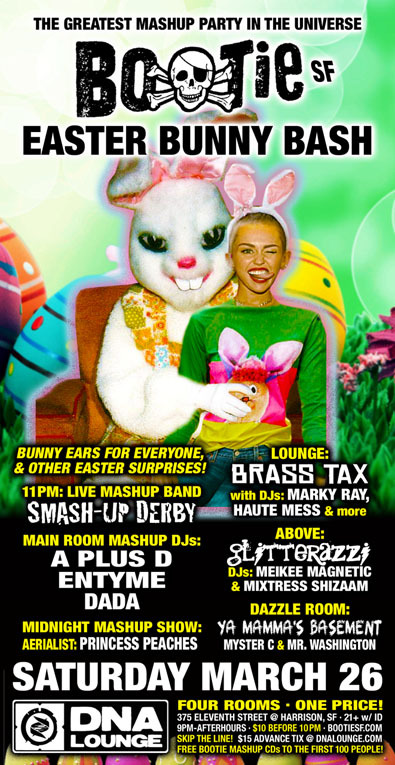 Bootie SF: Easter Bunny Bash! San Francisco Bootie SF: Easter Bunny Bash! Bunny ears for everyone, and other Easter surprises! $15 discount advance tickets — SKIP THE LINE! Available in link below. It’s Easter weekend, do you know where your bunny ears are? If you don’t have your own, grab some here because Bootie will have bunny ears for you — plus other Easter surprises! At 11 PM, there’s a special set from house band Smash-Up Derby, while resident DJs A Plus D, Entyme and opening DJ Dada keep the Easter beats flowing as they mix in springtime mashups throughout the night. Plus, aerialist Princess Peaches flies high above the dance floor for an Easter Midnight Mashup Show! Upstairs in Above, Glitterazzi welcomes you to the “Darkside of EDM”, as DJs Meikee Magnetic and Mixtress Shizaam take you on a journey of sight and sound with their brand of EDM, future bass, electro, house, and more. In the Lounge, it’s the delirious, roof-raising dance sounds of Brass Tax, as DJs Marky Ray, Haute Mess, and more spin party music all night! And in the Dazzle Room, Ya Mamma’s Basement brings the party you threw when your mom was out of town … the one you hoped she didn’t come home early to catch you throwing! DJs Myster C and Mr. Washington will get you bumpin’ and grindin’ on the dance floor, as they highlight the connection between hip-hop, funk, old-school, and R&B! All this, plus drag hosts Holy McGrail and Qween, as well as club photography by ShutterSlut and FREE Bootie mashup CDs to the first 100 people!